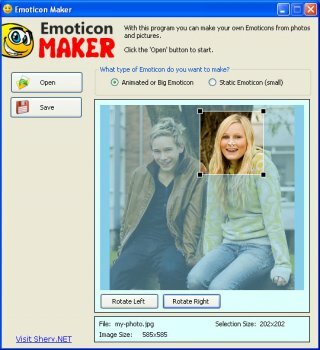 Emoticon Maker is a program that allows users to make their own emoticons and smileys from photos and pictures. Simply open the image using the program and make an emoticon from it. The program accepts GIF, JPG, PNG and GIF files as input. The GIF files can be static or GIF animations, both will work. Users are able to create big, small and animated emoticons. You can add the created emoticons to MSN and Live Messenger and use them anywhere else on the Internet or offline.